she smiles while she sleeps. Sharon and Brett met 13 years ago in Sydney and had wanted to marry for many years so when they stumbled across Wildhearted and Hitched they decided to run away to Queensland and finally tie the knot! They wanted to get away from the hustle and bustle of Sydney and being under the spotlight with lots of guests at a traditional wedding, and elope in a romantic spot, with just the two of them. They chose the stunning Crystal Creek Retreat for their Ceremony and stayed in a Villa on the property after their Ceremony for their honeymoon in paradise! Crystal Creek Retreat have a special wedding package where they set up a stunning signing table, lanterns, roses and also champagne to toast after their ceremony and a few extra goodies. 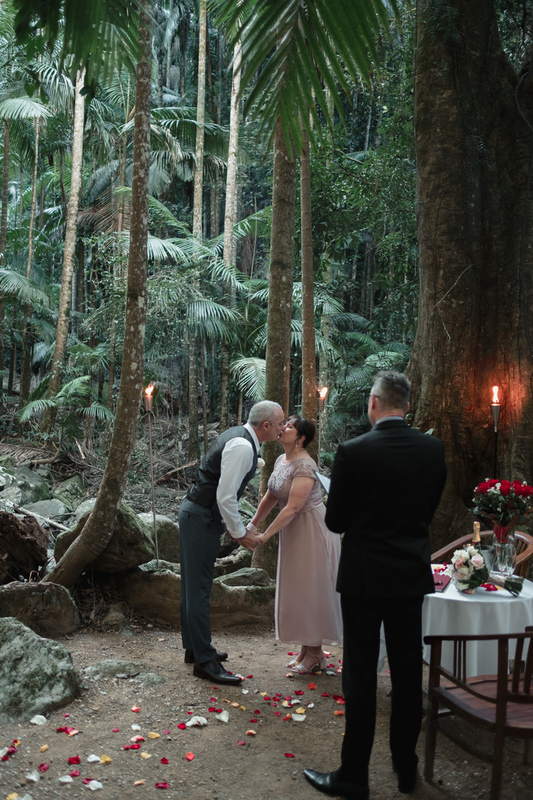 We had such an awesome afternoon exploring the Upper Crystal Creek Rainforest, with their memorable Ceremony set up under the 400 year old Blue Quandong Fig. After so many years waiting to tie the knot, it was an emotional, heartfelt ceremony and Sharon and Brett were so happy that it was all so easy and stress free.